Those are the words that got me! 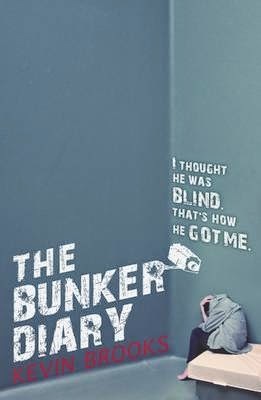 When I saw Kevin Brooks' book The Bunker Diary lying there on a shelf in the library, I was intrigued by those words on the cover. And what had happened to the person who said it? The story of the Bunker Diaries is told by 16-yeard old drifter Linus. His mother died when he was young, and he has a troubled relationship with his father. So one day he up and left, telling his father goodbye in a note. We 'meet' Linus in the bunker. He tells the story by writing down what's happening and his thoughts about it. Linus went to help a man who he thought was blind, and that guy knocked him out and then put in him in a bunker. After a while nine year old Jenny shows up in the bunker. Soon followed by four more people. Nobody knows who put them there, or what he or she wants. At first they try to think of a way out, and have meetings to come up with ideas. But soon the utter hopelessness of their situation becomes apparent. And all the while, as a reader, you keep hoping for a way out! Something good, that will help them. Or some information about the bad person that put them there. And why! I don't want to spoil the story, so I won't tell you how it ends. But let me say that it left me feeling shocked, longing for some closure and with lóts and lots of questions! You can get your own copy of the The Bunker Diary at Amazon.com for about four 4 bucks.